We’ve made this process as simple as possible, but there are still a good number of steps with a lot of room for error. 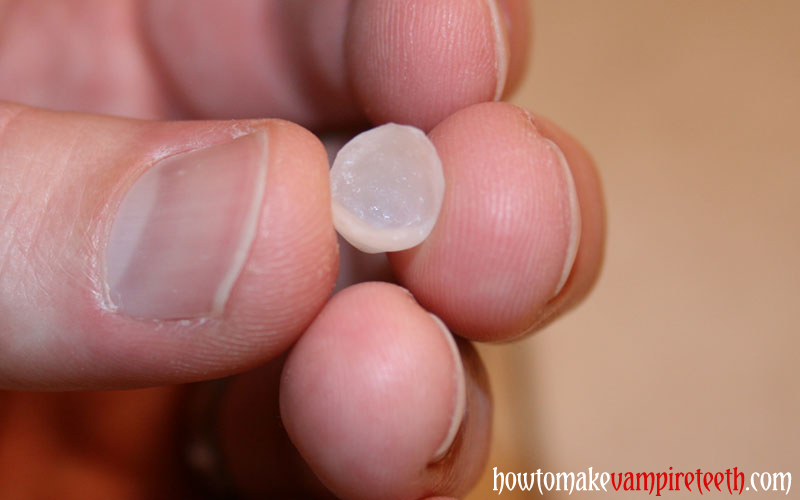 We’ve listed a few of the most common issues you may have when making your vampire teeth and possible solutions. If you have a problem not listed here, send us a message through our contact page and we’ll try to help you get to the bottom of it. I have voids in my acrylic! Patching the void can be quickly done by dabbing some fresh acrylic in the area. This is most easily done by taking some sort of small brush that will wick up a small amount of acrylic liquid. We used a spare paintbrush from a kids’ water color set. 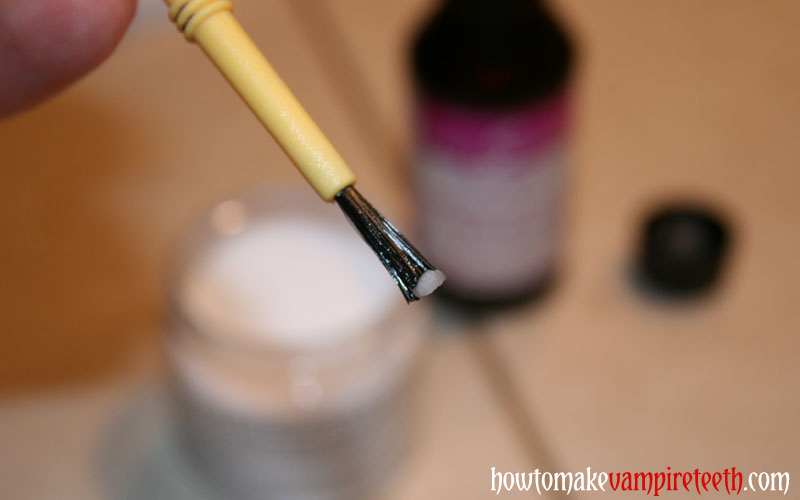 Dip the paintbrush in your bottle of acrylic liquid, then touch the tip of the brush into your bottle of powder. 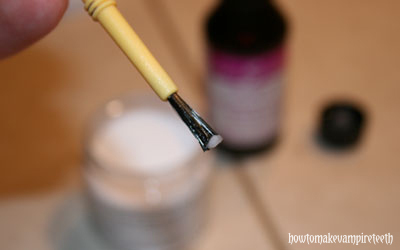 A dab of acrylic will form on the brush tip as shown below. The powder that sticks to the end of the brush will quickly absorb any surrounding liquid. You should have a nice smooth bit of acrylic which you can paint onto any voids. Let it set and polish again. My fangs don’t seem to fit right! If you’ve made all the adjustments you can think of to the exterior surface of your fangs and they’re still not fitting right (rocking, not seating all the way, etc.) you may have a problem with the internal surface. 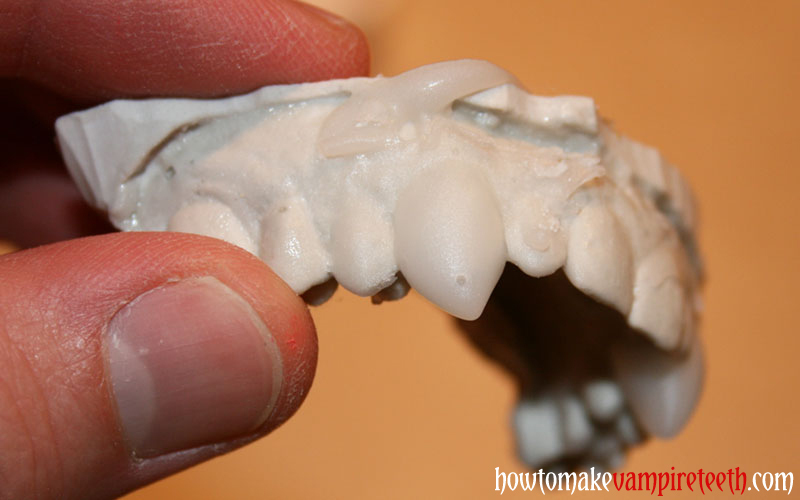 You need to be careful when adjusting this area because if you adjust too much, you’ve lost the custom-fit nature of your fangs. One common reason for a poor fit comes from issues with your model. 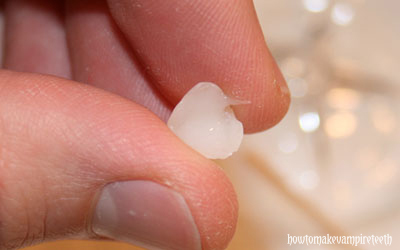 For example, if you have a sharp canine tooth, the very cusp tip may become blunted with regular handling of the cast. 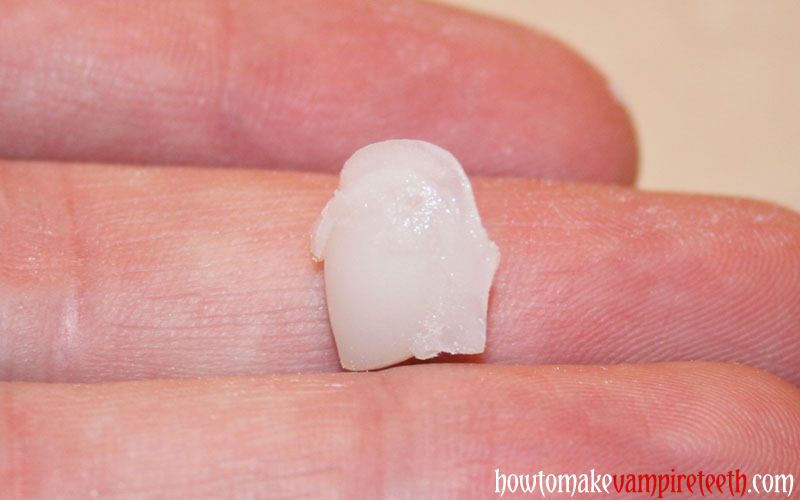 When you make your fangs, acrylic will fill the spot where your cusp tip should be. This will keep the fangs from seating completely. 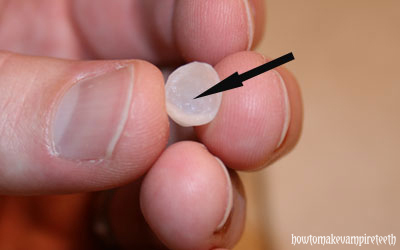 This is corrected by taking a small bur in your rotary device and grinding out the inside of your fang at the cusp tip. Remember, keep it minimal! If you don’t have a rotary device, you could attach a very small piece of sandpaper to a long thin object, like the manicure tool we showed you earlier, and grind it out by hand. See the next topic if you have more difficulty. I’ve adjusted my fangs everywhere I can think of and they still don’t fit! 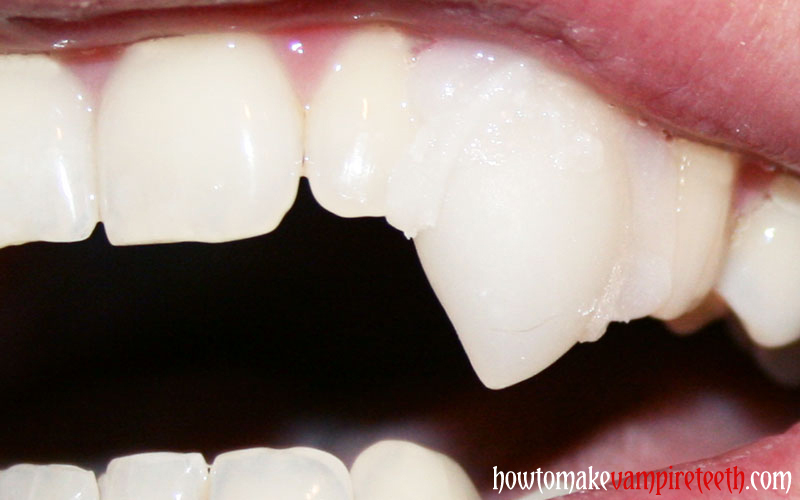 If you’re still having difficulty getting your fangs to seat properly, you might want to reline them. One great thing about acrylic is that you can add new acrylic and it will bond to the old. It might have a slightly different color or a line where the new material meets the old, but you should be able to make things look pretty darn good. This is a great technique for making sure you’re getting the best fit you possibly can, but only attempt this if you’ve read all of our instructions carefully. If you are not an adult, make sure you do this with adult supervision. Make sure your fang is dried. Mix some acrylic and fill the fang. Stick the fang on your tooth and seat it as fully as you can. Some of the acrylic should ooze out. 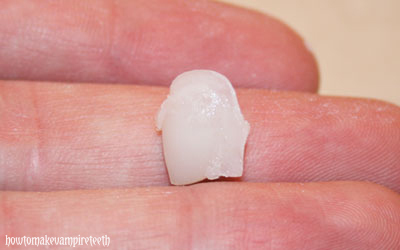 Leave the tooth in place for just a few seconds – just until the acrylic has become a little rubbery. Quickly remove the acrylic at this stage. Don’t forget, acrylic can become extremely hot when it sets up. You may burn yourself if you can’t remove the fangs in time! Also, if you let it sit too long, it will harden completely and if that bit of acrylic that oozed out has gone between your teeth it will be very difficult if not impossible to remove the fang. 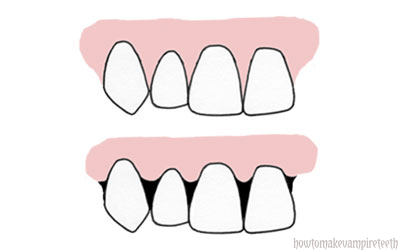 Typically, your gums will fill in all the spaces around your teeth (top image). 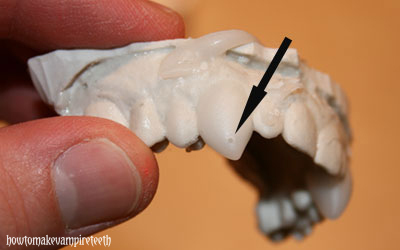 You might find however, that you have gaps around a few or all of your teeth (bottom image). Relining your fangs in this situation could become very risky. If the acrylic is able to flow between your teeth you should not attempt a reline. The above diagram shows a set of teeth with normal versus receded gums. The acrylic could easily flow into those areas and lock on. A dentist might be needed to remove the fangs in a situation like that. Here are some real life examples of people that should reconsider relining their teeth – click here, here, here, or here. The same applies if you have any dental bridge-work as well.